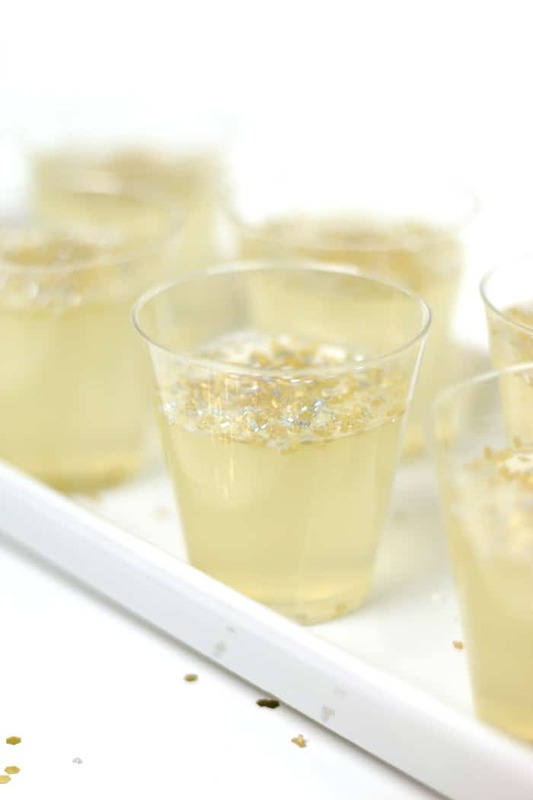 Champagne Jell-O Shots are the best way to celebrate any occasion! 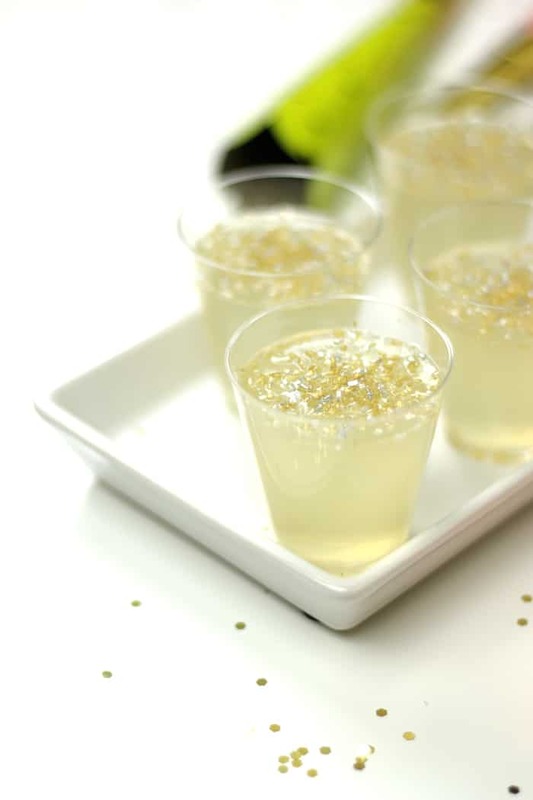 Use lemonade, real sparkling wine, vodka and gelatin to create this festive party treat and welcome the new year. If you celebrate, I hope you had an awesome Christmas. It was so great to spend time with my family yesterday, but I can’t believe 2014 will be over in less than a week. So crazy! With New Year’s Eve just a few days away, it’s time to figure out your party plans and make a list of new year’s resolutions. Maybe you can squeeze in one or two more things from your bucket list before the clock strikes midnight. You should add ‘making Champagne Jell-O Shots’ to the list, because these little guys are amazing. And so are these Apple Cider Jell-O Shots and these Baby Guinness Jell-O Shots. I haven’t made Jell-O shots since college (and even then I didn’t make them a lot). I can tell you that college-level Jell-O shots are gross — and I write that with the utmost nostalgic fondness. Once, I helped a friend make hundreds of tiny cups filled with boozy, bright blue jiggly stuff for a party. Back then they were just fun treats for tailgates and house parties, and I can’t say I’ve missed them all that much. Recently, though, I decided to look into different kinds of Jell-O shots. This was all delightful news, and I was glad to stumble across some recipes for Champagne Jell-O Shots. How perfect for New Years Eve! 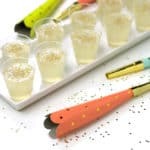 Champagne Jell-O Shots are tiny, gorgeous cups filled with champagne-flavored gelatin made with a mixture of lemonade, plain or lemon-flavored vodka and sweet sparkling wine, then topped with glittery gold and white sprinkles. 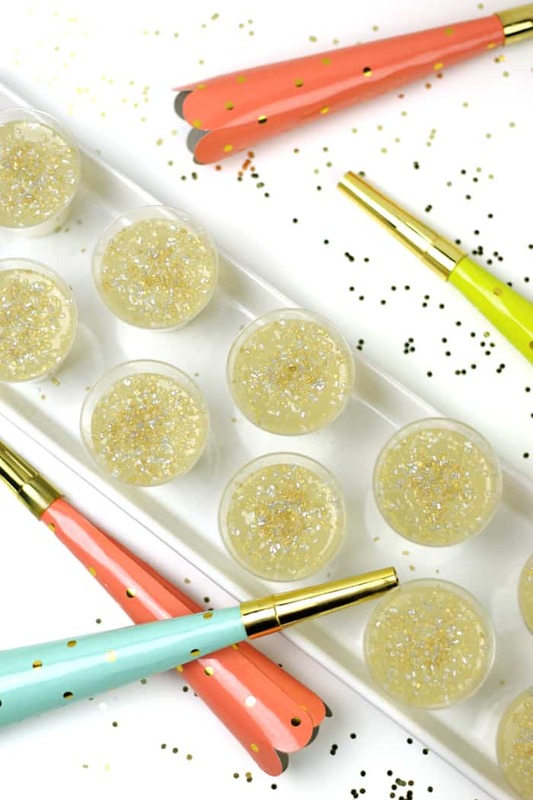 Yes, we top them with glittery sprinkles, because the only thing more festive than Champagne Jell-O Shots would be glitter Champagne Jell-O Shots. 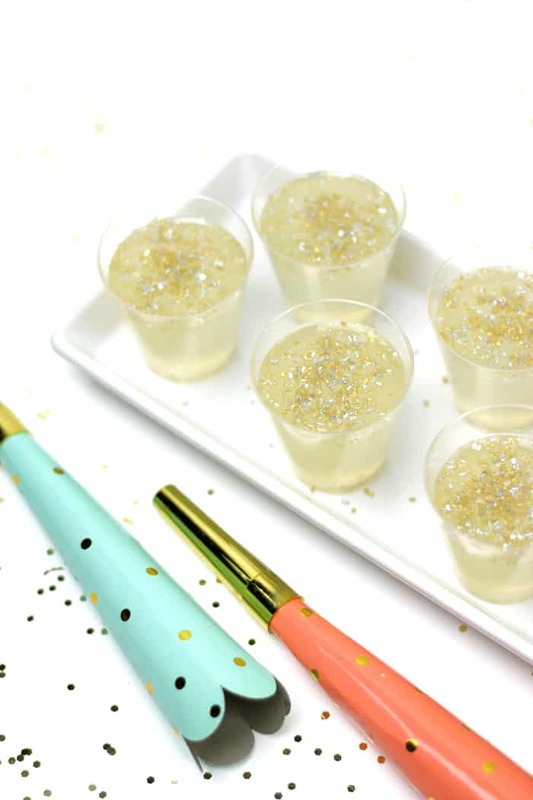 These Champagne Jell-O Shots would be a perfect companion for New Year’s Eve, and you could even make lots of them for a large party to avoid buying cases of champagne. 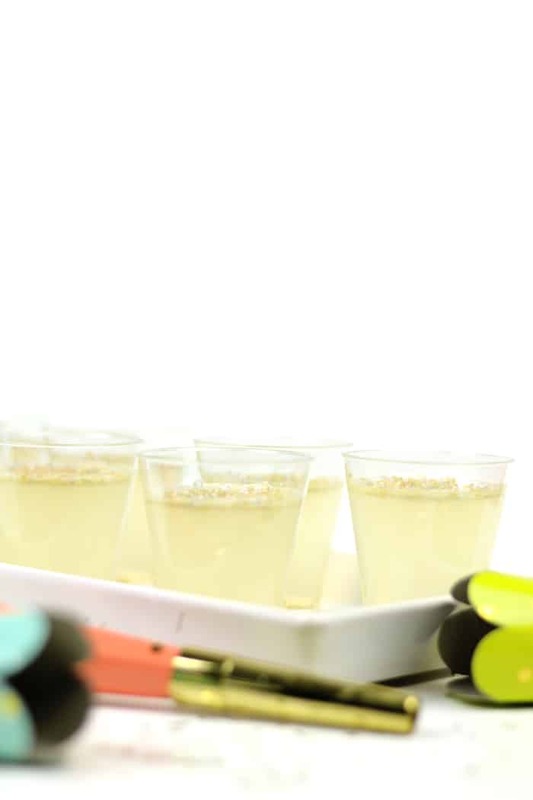 To make this Champagne Jell-O Shots recipe, you’ll need little shot glasses! I like these plastic shot glasses for a party, but these small ones have lids for transporting them. Or, go green and use a set of glass shot glasses that you can wash and reuse. Even fancier would be serving Champagne Jell-O Shots in coupe glasses with spoons! I find that a light coat of cooking spray helps the Champagne Jell-O Shots to pop out of the glasses better! (And faster!) I like this refillable spray can for cooking spray. I already have some New Year’s plans lined up, but if I were celebrating at home, I would definitely be making these Champagne Jell-O Shots again. They’d also be wonderful for a bachelorette party, or any celebration, really. They are so much fun! Throughout 2014, I shared a lot of different cocktails with champagne or prosecco as a primary mixer, so I wanted to do something a little different for the blog for New Year’s. 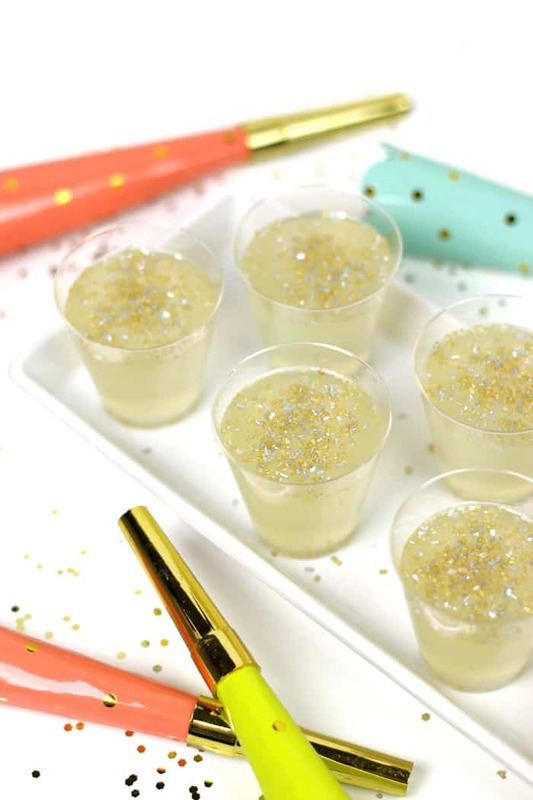 Love these Champagne Jell-O Shots? I’ve got more Jell-O shot recipes! 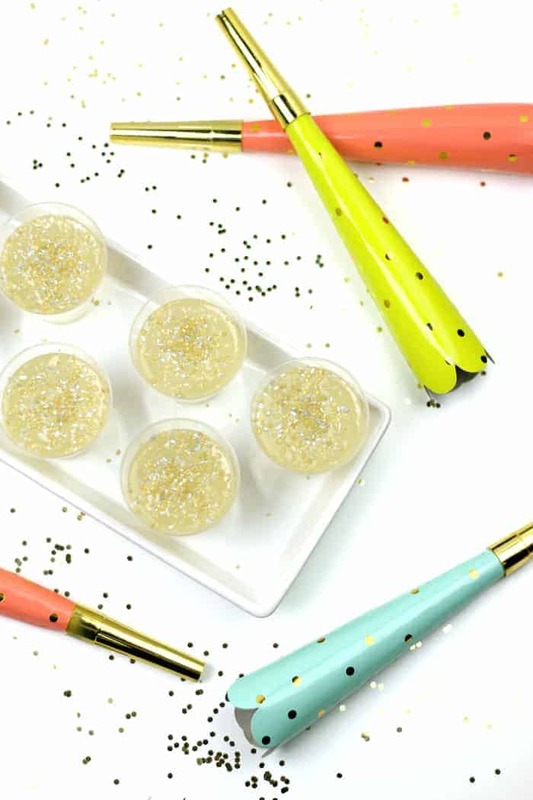 Pin these Champagne Jell-o Shots! Prepare molds. (I used plastic shot glass cups, but you can also use cupcake wrappers or mini-muffin tins.) Spray them lightly with cooking spray. Sprinkle the sanding sugars in the bottoms of the molds. Soften gelatin. 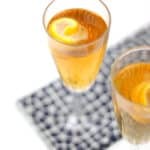 Whisk together sparkling cider or lemonade with 1/2 cup water in a small saucepan. Sprinkle gelatin over top and allow to rest for 5 minutes until gelatin is softened and the liquid’s surface appears slightly wrinkled. Dissolve the gelatin. Warm the liquid over medium heat for 2 to 3 minutes, stirring until gelatin is completely dissolved. Do not let boil. Remove from heat. Add liquor. Whisk in the vodka and champagne. Fill the molds. Distribute the liquid evenly among the molds. Refrigerate 3 to 4 hours before serving. Serve. If using a mold (in lieu of cups), dip bottom of pan into hot water for 5 seconds. Run a paring knife around the edge of the Jell-O to loosen. Flip out the molds onto a wax paper-lined surface. Keep chilled until serving. Sprinkle with more sanding sugars before serving. I tried both lemon vodka and plain vodka in this recipe, and both were excellent. 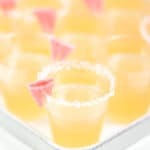 The sanding sugars are optional, but create a bubbly look for each jell-o shot. 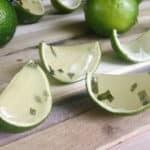 Add a pinch to the bottom of each shot glass before adding the gelatin mixture, then add another sprinkle to the top once the shots have hardened, just before serving. These sound delicious! I might need to make these! Thanks Katie! I think you’d love them. They are seriously so much fun! Perfect for New Year’s Eve!! Thanks for sharing! =) I hope you and yours had a wonderful Christmas and will have a joyous New Year! These look like so much fun to make and have at a party!! And I just can’t get over your photography. Awesome job!! Aww thanks, Shaina! I appreciate that. 🙂 And yes, so fun! Definitely worth the time to make them ahead. Could these be made kid friendly by substituting more of the sparkling cider for the champagne? 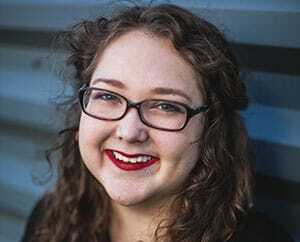 Hey Rachel! Thanks for your comment. That is a really great question! I am so glad you asked. You will need 1 cup of liquid for every envelope of gelatin. (This recipe calls for two.) You can ABSOLUTELY exclude the alcohol! Just be sure to make up the difference with more liquid, which can be anything – sparkling cider, apple juice, cranberry juice, whatever! I hope that helps! What flavor gelatin did you use? These are beautiful! Hi Whitney! Thank you. I used plain unflavored gelatin. The lemonade and champagne provide enough flavor! I just made them again yesterday. So good! What if I use lemon Jell-O instead? Hi Angela! You could try! I’ve never done it. I prefer to use plain gelatin to control the flavor. you said only .5 ounces??? how when a packet is 3 ounces? Hey Jennifer! This is a great question. I should clarify, I am using Knox brand gelatin (affiliate link). When I buy it, it comes in packets/pouches of .25 ounces each. That is equivalent to 2 1/2 teaspoons or 7g unflavored gelatin, so for this recipe you would need double that (.5 ounces, 5 teaspoons or 14 grams). If you are using another brand, I would suggest measuring it out with teaspoons or a food scale. I hope that helps! Hi. Do these melt when left on a dessert table indoors? Hi Faith! They should be okay at room temperature for a few hours! I haven’t experienced melting myself, but I would guess it would be only in warmer temperatures, or if they sit out a long time. The gelatin should hold, but they can get soft. Then again, my crowd tends to devour them before that happens! I hope that helps! I am confused. You put sanding sugar in bottom of cup. But if you are serving these in cups as shown in picture then the sugar won’t be seen. You don’t mention when to add sprinkles? After it hardens? Then how will they stick to jello? How about adding sprinkles after an hour of hardening before fully hardened? Do you use either sanding sugar or sprinkles ? Hey Sue! If you put the sanding sugar in the bottom of the cup first, then when you pour the liquid in, it allows the sugar crystals to swirl around and it gives the shots a “bubbly” look. It’s a totally optional step. You can also sprinkle them on top right before serving, if you prefer. I’ve updated the recipe to make this a bit more clear. Thanks so much for stopping by to ask this! Hope it helps! How far in advance can these be made? Champagne is fine to use instead of sparkling wine? Thanks for sharing this recipe! Hey Michelle! I would make them up to a day or two in advance for a party. And yes, champagne is a sparkling wine so it is fine to use! Prosecco, cava or anything of that nature is perfect as well. 🙂 Happy new year! Hi! 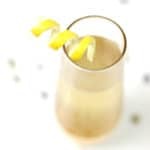 What kind of sparkling lemonade do you use? Thanks! Hi Haley! You can use any kind of sparkling anything, really! I usually use a sparkling cider like Martinelli’s, but any brand of sparkling lemonade will do! I usually can find it in the juice aisle of my grocery store. You can also use Sprite or ginger ale if you can’t find the others. What you’re looking for here is the bubbles and a hint of flavor and sweetness. Hope this helps! After warming, there is still foam on top. Is this ok? Hey Elizabeth! I would make sure to keep stirring until everything has dissolved, but a few bubbles are definitely okay. It’s not unusual to see the bubbles in the cups when you pour the mixture in, and most of the bubbles will pop when the shots set up. Any remaining bubbles will just make them look a bit more like champagne! Hope this helps.